I do quite a bit of spatial analysis and mapping in my academic research, and some of it ends up on this blog. 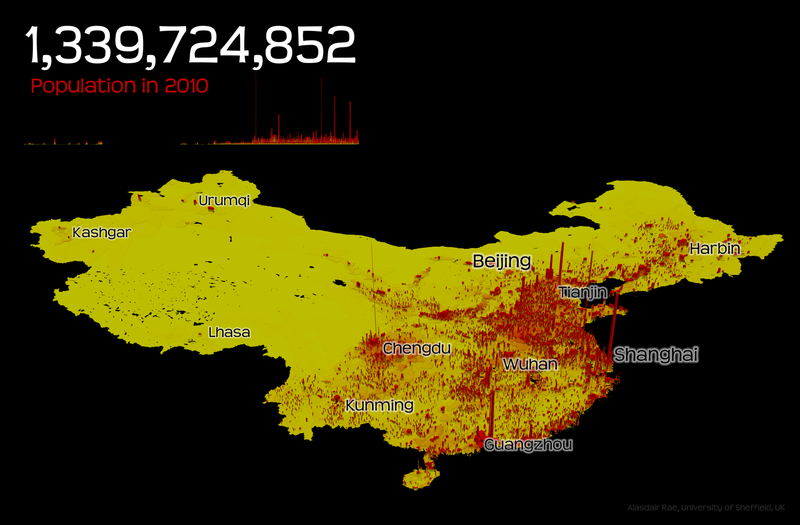 Over the past few years I've done quite a few 3D* maps - most recently one of population density in China. A comment by map-guru James Cheshire made me think about the 3D issue, hence this post, which attempts to say a little more about why I like using the third dimension, as it were. Also, there's not much about this stuff online at present. The two images below show population density in Europe at NUTS3 level, with a colour scale running from red (high density) to blue (low density). Click the images to enlarge. but that doesn't matter for now - this is just an example. The reason I like the addition of the third dimension with this kind of dataset is that you can tell more about the differences between areas within the same statistical category. Essentially, it adds an additional dimension of information that you can not observe from the conventional 2D map above. This is particularly true of the most high density areas in the first map. There is of course an issue here about the relative size of areas and how this might change the population density of different places but that is a different matter since I'm not in control of NUTS3 definitions! For more on this kind of thing I'd recommend looking at Stan Openshaw's work and for more on the utility (or futility?) of choropleths generally Tobler (1973) is an excellent starting point. Gale and Halperin (1982) is also worth a look. If we assume that the main purpose of a choropleth map is to present and discover spatial patterns then there is sometimes a strong case for using the vertical dimension and extruding polygons using a z-variable (I do this in ArcScene, in case anybody is interested). However, there are some complications and I don't think it is always appropriate to go 3D. For example, depending upon the spatial structure of your data extruded polygons in one area can obscure those in another. There is also the issue of the different size of areas and the way these might have an impact upon the level of extrusion - i.e. 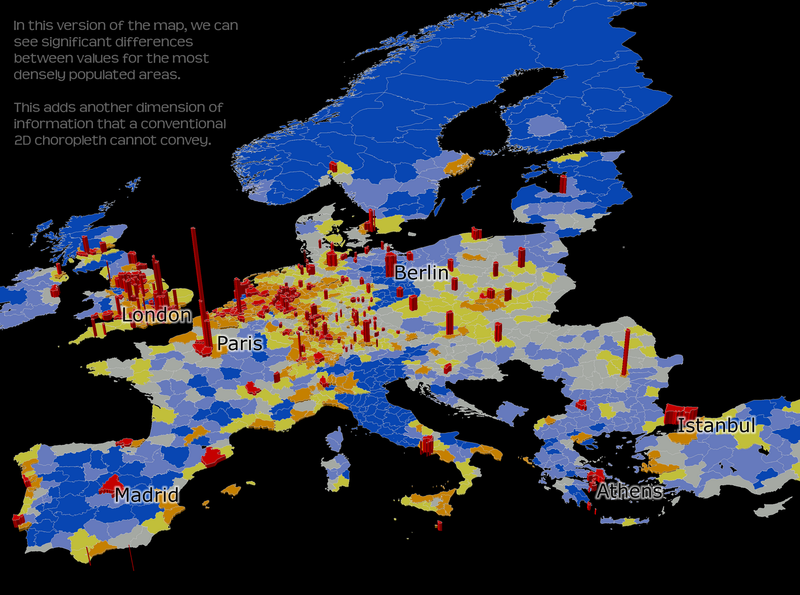 if we used 1km cells for the European population density map it would look rather different in 3D - though this is possibly another artifact of the modifiable areal unit problem, as described by Openshaw. I've patched together three different examples from my blog in the image below, just for comparison. 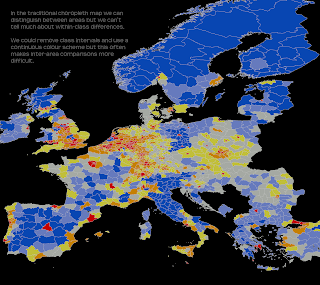 Another option would be to follow the example of Ben Hennig and produce population-weighted cartograms. When I produce these 3D maps (or visualisations) I'm not trying to create a geographically precise rendering of space but rather I'm attempting to draw attention to variations in a dataset in a way which 2D maps can only do to a limited degree. They are abstractions and simplifications but in terms of understanding the world I find it can be an improvement. There is a little bit about it in this Environment and Planning B paper I wrote but I plan to write more about this in the near future (the'near future' in geological terms of course). In a few weeks I will be travelling to China for a conference, where I'm co-presenting a paper on regional inequalities in China and the EU. This has meant I've had to get hold of lots of Chinese datasets, some of which I have produced maps from - so I thought I'd post one or two here, along with some facts and figures. I should point out that most of the data I've been using has come from the National Bureau of Statistics of China website. 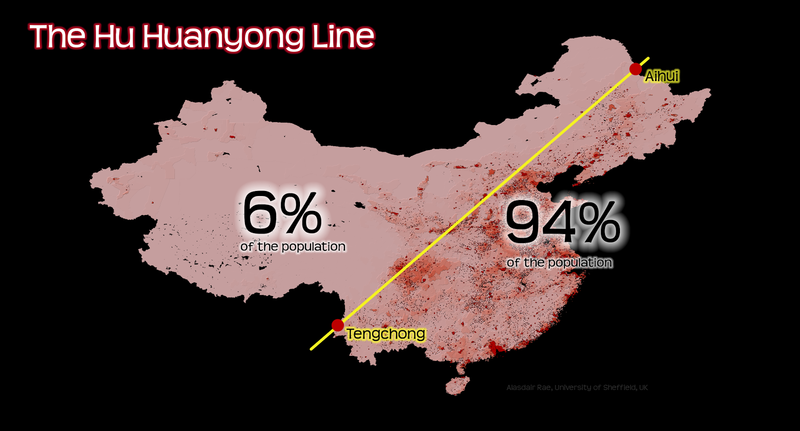 I'm still working on my parts of the presentation but am really fascinated by the facts and figures emerging from the 2010 Chinese census and data for different regions of China. China accounts for almost exactly 20% of the world population and both Beijing and Shanghai (i.e. the provinces) have 20 million or more people. I still need to learn a lot more about China, Chinese data and regional development there generally but my work so far suggests that patterns of regional inequality - while different in absolute terms - are often strikingly similar to patterns of regional inequality in Europe. A good example of this is in Jiangsu province, to the north of Shanghai. Citations: Center for International Earth Science Information Network - CIESIN - Columbia University, International Food Policy Research Institute - IFPRI, The World Bank, and Centro Internacional de Agricultura Tropical - CIAT. 2011. Global Rural-Urban Mapping Project, Version 1 (GRUMPv1): Population Density Grid. Palisades, NY: NASA Socioeconomic Data and Applications Center (SEDAC). http://dx.doi.org/10.7927/H4R20Z93. Accessed 10 June 2012. Balk, D.L., U. Deichmann, G. Yetman, F. Pozzi, S. I. Hay, and A. Nelson. 2006. Determining Global Population Distribution: Methods, Applications and Data. Advances in Parasitology 62:119-156. http://dx.doi.org/10.1016/S0065-308X(05)62004-0. P.S. Thanks are due to Chunhua Liu for her insights here! A couple of years ago I blogged on the Red Road Flats in Glasgow and their imminent destruction. It wasn't quite as imminent as I thought but it now appears that next Sunday, 10th June 2012 153-213 Petershill Drive will be demolished. 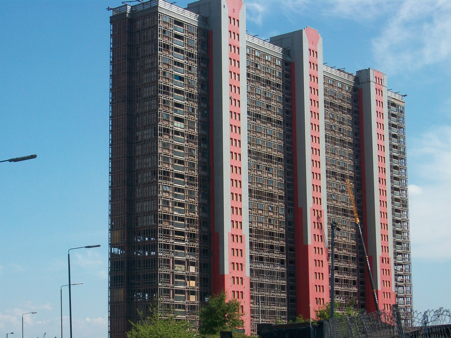 As someone with an interest in planning, urbanism, architecture and Glasgow this is a significant event because it represents the end of an era, and in particular the end of the great public high-rise housing experiment that Glasgow embraced. The demolition story is documented on Safedem's Red Road Demolition website and the demolition itself can be viewed live there next Sunday. I'm sure they'll also have lots of video coverage of the event soon after, as they normally do. You can find more details about the original project and architect on these pages. For me, the most interesting and important aspect of Red Road are the stories told by people who lived there, which are captured on the Red Road Flats website.